Shami Chakrabati has published her report into anti-semitism within the Labour Party. She has concluded that the Party is not “overrun” by anti-semitism (or any other forms of racism) but that there is an “occasionally toxic atmosphere”. She said there was “too much clear evidence… of ignorant attitudes”. Read it asap, then we’ll have a discussion. In a previous post I dealt with the argument from ‘Lexit’ (ie left pro-Brexit) campaigners that the chaos an exit from the EU would create for the ruling class would, inevitably, benefit the working class. For ‘Lexit’ people this functions as a Deus ex machina, overcoming the unsolvable problem of their failure to grow as a movement and acts as a substitute for activity within the working class. We now have Brexit and with it chaos in spades, and we will soon see just what a wonderful new dawn it will usher in for socialism and the working class. In the meantime the Brexit triumph has to be painted as a great working class victory: the Socialist Party’s Peter Taaffe has duly obliged in an article published in their paper and on their website. To do this he has to begin with two big – very big – assertions. The vote “…represents at bottom a predominantly working-class revolt against austerity” and it is “… totally false to draw the utterly pessimistic conclusions… that this result could lead to a ‘carnival of reaction’ in Britain and encourage right-wing forces in Europe and elsewhere”. From these two assertions the rest of Taaffe’s views follow; in fact both of these statements verge on the delusional. A recent report form the Europe Council on Foreign Relations: The World According To Europe’s Insurgent Parties: Putin, Migration And People Power points to the rise of insurgent parties across Europe some are of the left but mainly of the populist right; they are “sceptical about the EU, resent the United States, and are sympathetic to Russia. Most prefer borders closed, migration low, and trade protected. They all want to return power to the people through direct democracy”. While some parties on the left such as Podemos want to reform the EU, it is the parties of the populist right who have been emboldened by Brexit. It was Le Pen from Front National, the Northern League from Italy the Austrian FPO and the Dutch PVV who hailed it as a victory for their own anti-immigration and anti-EU stances. This relationship between Brexit and the European populist right has simply escaped Taffe’s notice – or perhaps he regards it as merely incidental in the ever-onward march of socialists towards inevitable victory. In Britain Ukip has been gaining traction for a number of years. In the 2015 election they gained 3.5m plus votes (12.6% of the electorate) displacing the Lib-Dems as Britain’s third party. Over the last year they have made small but noticeable encroachments into unions’ workplace positions. It is inconceivable that Brexit has not increased their stock and if Johnson et al fail to deliver on controlling the boarders, then for sure Ukip will be there to pick up disillusioned Brexit voters. It is not only the neck of the new Tory leadership Ukip will be breathing down: it is also the Labour Party’s. After the 2015 election Ukip declared the gaol of replacing Labour in the North. Having come second in some 120 seats they are now well on the way to building up a constituency infrastructure as the prerequisite to a stable and ongoing challenge to Labour. It is self-evident that the referendum has further consolidated and extended Ukip’s working class base. Just as the with reactionary consequences in Europe, the consequence of the Brexit victory boosting Ukip and the right in general is not on Taaffe’s radar – indeed how could it be when he considers Brexit a great triumph for socialism. So Brexit voters clearly fall into the category of those deserting Labour. One would think as a general rule socialist would err on the side of social liberals rather than the socially conservative – but such a presumption cuts no ice with Taaffe who is unequivocal; Remain workers were “… cynically exploited by the Tory ‘remainers’ and their supporters”. The Brexiteers are a different matter: `”Traditional Labour areas and regions [who] voted heavily against the government…Even where remain won a majority there was an unmistakable working-class determination to show ‘them’ – the Tories and the remain elite – that ‘enough is enough'”. Such a black-and-white division is in fact essential to the ‘analysis’ put forward by Taaffe and the Socialist Party (SP) as it enables them to conjure up Brexit workers, and their struggle against the “elite”, as a tablou, the backdrop illustrating the correctness of the SP stance on the EU. Taaffe is able to assert this division exists because while Remain are seen as dupes, Brexiteers are somehow ideologically free agents, pushing a spontaneously arrived-at class positon. While for sure Lexit had no say in the leave campaign, the ideas and views that Brexit-voting workers listened to and absorbed were those of the Brexit campaign. The key – the main and often the only – message workers picked up from Brexit was stopping immigration which merged with their own independently arrived-at view. The élan Brexit achieved was due entirely to Johnson and Gove saying to workers what they wanted to hear: leave the EU and we will stop immigration. 80% of leave voters said immigration was bad, 35% of Labour Leave voters cited the need for border controls (as opposed to 27% of Tories) as the main reason for voting Leave. Absenting himself from tiresome facts, Taaffe has conjured up an ideologically- free imaginary movement arising from the Leave campaign – implicitly and/or ‘unconsciously’ socialist (or at least, ‘progressive’) in character. But the harsh reality is Leave voters were tied hand and foot to the racist-right Brexit campaign, and how could it be anything else? Taffe tells us in a half-hearted concession to this point “…it is true that the racist …UKIP was for leave, as was the Tory capitalist brutalist duo of Johnson and Gove, with an emphasis on scapegoating immigrants. Some workers were no doubt seduced by the anti-immigrant message of these reactionary forces”: if this means anything it is an attempt to say the SP (and perhaps the rest of the Lexit campaign) were in competition with the two main right wing Leave campaigns, putting the anti-EU case to the workers. Outside of the SP self-deusionary propaganda circles the reality was that Johnson and Gove were the Leave campaign with Farage providing their more forthright, openly racist, flank. While the SP and Lexit supporters continue to deny the character of the Leave campaign and refuse to countenance its reactionary consequences in the real world, the rest of us are confronted with just that. While the bill in jobs and terms and conditions has still to be presented, we have already seen that Brexit has lowered the racist bar, back to where we were in the late ‘60’s, with a racist surge of verbal abuse and in some cases physical attacks taking place across the county. 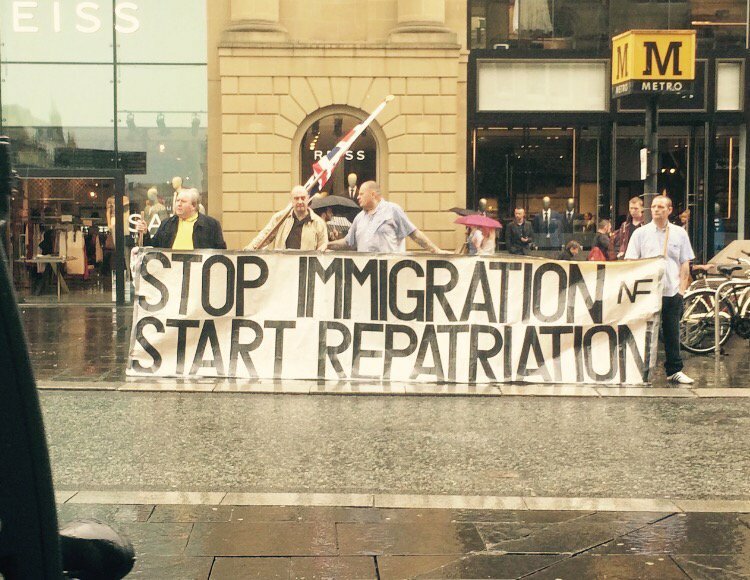 Brexit has not just brought overt racism back onto the streets: it has placed immigration at the centre of the political stage. 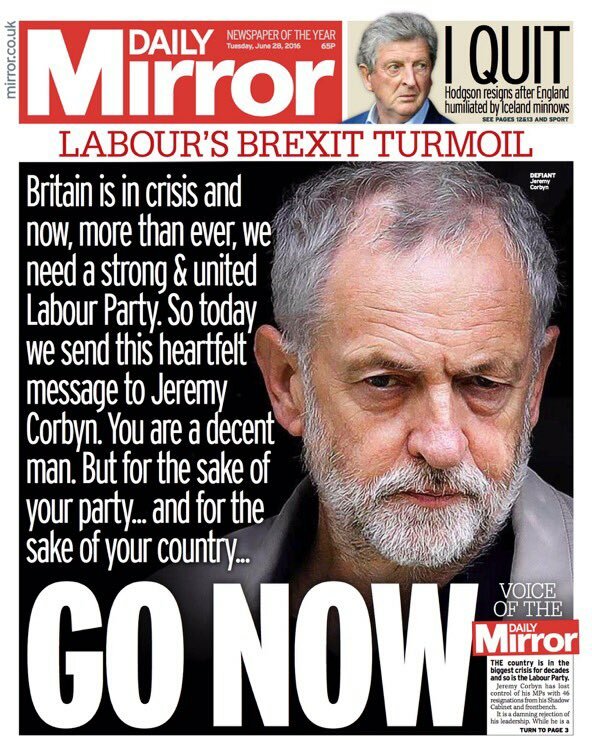 It is this rather than class upon which the political axis now turns: if an election was held today even a Labour party united behind Corbyn would struggle as the question of border controls is now the centre of the political discourse. Anyone who spoke to workers during the campaign will know how immigration was the alpha and omega of any discussion: the lack of understanding and the repeating of misinformation existed on a breath-taking scale. Whatever else socialist and in particular trade unionists do we need to engage with Brexit workers and our starting point is not to call them racist bastards’ or suggestthat we should all hold hands, celebrate our diversity and be nice to one another. Rather it is to explain why the immigrant is the wrong target. Nonsense like Taaffe’s delusional (indeed, self-delusional) article will not help us do that. AWL statement: Stop the anti-Corbyn coup! Labour’s right is trying to stage a coup. If the Corbyn leadership and the unions stand firm, and force the right wing to put up a candidate against Corbyn in a new leadership contest which Corbyn wins, this attempted coup could turn into a rout. The way will be open for the unions to get through Labour Party conference democratic reforms which they have already put in draft form, and for the Labour Party really to be revived as a living movement, close to the unions, and with the right wing discredited. But if it goes the other way – if the unions swing over to back a rotten “compromise”, or if Corbyn buckles – then the right wing be in pole position to shut down all the channels reopened in the last year. They won’t be able to do it all at once, but they will be well-placed to destroy today’s possibilities of creating a real working class alternative in British politics. With their staged series of shadow cabinet resignations, Labour’s right have seized the chance of the dismay and disarray caused by the Brexit vote to try to reverse the Labour revival generated by the 2015 leadership contest and Jeremy Corbyn’s landslide victory. As we go to press, they are staging a stand-off, an open split in the Labour Party, and using it to press Jeremy Corbyn to resign. They could force a leadership contest by getting 50 MPs to nominate a rival candidate. For now at least they are not doing that, because if they do that then Jeremy Corbyn has to be on the ballot paper in the leadership election, and will probably win. They want to force Corbyn to resign, confident that if he does then they can deny any left-wing candidate the MP nominations necessary to get on the ballot paper, and so deny the members a choice. There is talk of setting up a rival Parliamentary Labour Party in opposition to the one led by Corbyn, or even splitting the Party outright. Probably this talk is designed to panic and pressure the Corbyn camp. Some of the coup-plotters talk about the desirability of Labour wining the next General Election. But that is clearly low in their priorities. Otherwise they wouldn’t be splitting the party now. Otherwise they would shelve for now their criticisms of Corbyn and focus on unity against the shocked, dislocated, and divided Tories. Some of them talk about unity. Some of them claim they have no difference with Corbyn’s politics, and praise his kind and friendly manner. They so value unity… that they make a split! When they claim to have no serious political grounds! Some of them say Corbyn has been weak. Sometimes he has: often because he has constrained by them, or allowed anxiety to conciliate them to mute his message against the Tories. The role in the script for those soft-soap types is to serve as cover for someone with a vaguely soft-left profile to emerge as front-person (while the hard right-wingers pull the levers in the background), and to try to persuade the members and the unions to support them as promising both unity and not-too-wrenching a reversal of Labour’s course. To be for 2016 what Neil Kinnock was for 1983. Some of them talk about Jeremy Corbyn being poor in the Remain campaign. But what about them? What about the Labour figures who joined platforms with the Tories, copying Labour’s wretched policy in the Scottish separation referendum? What about Tom Watson and Ed Balls, who gave Leave a last-minute boost by saying that Labour should limit EU migration? What about the Labour right-wingers from whom we heard nothing at all? What about Corbyn-baiter Gloria de Piero, whose safe-Labour constituency returned a 70% Leave vote? Or Stephen Kinnock, another Corbyn-baiter, who got a 57% Leave vote in his ultra-safe Labour area? Or Labour right-winger Alan Johnson, appointed to lead the Labour Remain campaign. Did you ever hear from him? His Hull area voted 68% Leave. They wail and scream about one-third of Labour voters backing Leave. That is bad, but not surprising: one-third of Lib Dem voters, and one-third of SNP voters, also went for Leave. Especially not surprising when for many older Labour voters, anti-EUism has been a major and sometimes dominant thread in Labour politics for the last half-century; when the 2015 Labour election campaign organisers, backed by most of the anti-Corbyn plotters but not by Corbyn, produced a “campaign mug” inscribed “Control Immigration”; when most pro-EU Labour politics has had, for 20 years, the neoliberal face of Blair and Brown, blandly praising “modernisation” and ignoring the havoc caused by free-ranging global capital in many working-class communities. The coup-plotters want to return to the same soft-Tory politics and undemocratic organisation which have gutted and enfeebled Labour’s base for decades now, and block the possibilities of a renewal. Anti-Corbyn Labour MP Yvette Cooper talks about “broader arrangements to build a wider consensus” with the Tories in the management of Brexit. Corbyn’s own response to the 23 June decision has been weak – he should be more vigorous, from our angle, in defending freedom of movement and European ties, than the Tories now pressing the “Norway option” are from theirs – but these people want to be even weaker. Stay strong! Stand firm! Labour members and trade unionists must rally in defence of our movement’s democracy. This morning after delivering some Sarriette (summer savory) plants to my comrade Sarah I passed by Rope Walk. A group of 3 tasty geezers were talking about the Referendum. 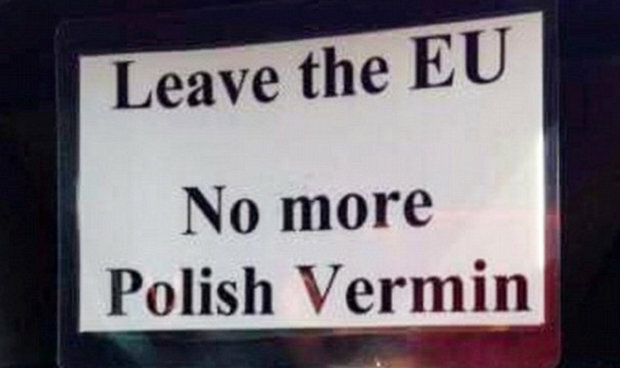 Purported responses to Brexit include signs saying ‘Leave the EU, no more Polish vermin’ being posted through letter boxes. Many of the alleged perpetrators cited the decision to leave the EU explicitly. The ‘Lexit’ gang predicted that there would be some kind of “opportunity” for the left in the event of a Brexit vote. HUNDREDS of people have protested in the capital as they demonstrated against Britain voting to Leave the EU. Jeremy Corbyn unveils new top team after resignations. reports the BBC. Labour leader Jeremy Corbyn has announced a new cabinet following a wave of resignations in protest at his leadership and amid calls to resign. Mr Corbyn lost 12 of his shadow cabinet on Sunday and five shadow ministers on Monday – with most criticising his performance in the EU referendum. Mr Corbyn said he regretted the walkouts but pledged to stand in any new leadership election. Labour MPs are due to discuss a no confidence motion against Mr Corbyn. The shadow cabinet shake-up sees Emily Thornberry – who on Sunday gave her backing to Mr Corbyn – moved from shadow defence secretary to shadow foreign secretary, replacing Hilary Benn who was sacked at the weekend. Meanwhile, Diane Abbott – an ally of the Labour leader – has been promoted from shadow international development secretary to shadow health secretary, a position vacated by Heidi Alexander’s resignation. The latest frontbench resignations came on Monday, by shadow foreign minister Diana Johnson, shadow civil society minister Anna Turley, shadow defence minister Toby Perkins, Wayne David, the shadow Cabinet Office, Scotland and justice minister and shadow consumer affairs and science minister Yvonne Fovargue. Stephen Kinnock, a parliamentary aide to shadow business secretary Angela Eagle, has also quit, citing Jeremy Corbyn’s “half-hearted and lacklustre role” in the EU campaign. On 24 June, as the Brexit referendum result hit the school where I work, both students and teachers were aghast. The idea that this was a “working-class revolt” inflicting “a massive reverse” on the rich and powerful had no takers in a school whose catchment area is among the 5% poorest in the country. Some students told me “I have dual nationality, Slovak and British [or whatever it might be], so I’ll be all right. But…” And they’d sigh. Yet some on the left are jubilant. The Socialist Party claims “the fundamental character of the exit vote… was a working class revolt” causing “the anger and despair of Britain’s elite” and probably “the collapse of the Tory party”. The Socialist Workers Party (SWP) is less fantastical, acknowledging that “the Left Leave campaign we were part of had only a marginal effect”. But somehow, it claimed, “the rich and the powerful… have suffered a massive reverse” – through the bit of the “Leave” campaign which had a not-at-all-marginal effect, the right-wing bit. (One survey before the referendum found that active “Leave” campaigners were broadly 60% Tory, 40% Ukip. Odd leaders for a “working-class revolt” against the “rich and powerful”). The SP, the SWP, and the anaemic Lexit/ Left Leave campaign have all responded by demanding an immediate general election and predicting a left Labour Corbyn victory in that election. In fact, this moment of high dismay for the left has quickly been seized on by the Labour right to launch the motion of no confidence in Jeremy Corbyn they hadn’t dared to push until now. They could see things moving their way when, even before referendum day, left-wingers like Paul Mason, cowed by the Brexit surge, had started arguing for Labour to propose blocks on immigration from Europe. Jeremy Corbyn’s and John McDonnell’s statements since the result have been sadly weak, and most of the left has been pushed back into a defensive stance against the attempted Labour-right coup. The very rapid online support for Corbyn suggests we can beat the coup. But the direction of movement, for now, is not from Corbyn surge to a super-surge pushing the Tories out, but in the other direction. “Cameron out” is no left-wing slogan when it is actually happening, and he is due to be replaced by a more right-wing Tory! The Tories will now proceed with more right-wing business. Possibly some pro-EU Tories will choose to fade out of politics, but they won’t launch a party split now, which would be on a hiding to nothing. There will be Tory tensions over the terms of Brexit, but those are for the years to come, not the next few weeks. And they will be over adjustments and calibrations, easier to manage than the sharp in/out conflict over the EU which has divided the Tory party for 20 years. There is little prospect of a general election. Why ever would the new right-wing Tory leadership respond to the democratic mandate they now claim, not by pressing ahead, but by nervously provoking a vote of no confidence? Maybe Gove and Johnson will overreach themselves, and the left can rally and quickly turn things round. But not if the left tells itself that things are already going the right way! The core argument of the Brexit left is that any disruption that causes dismay among the majority of the ruling class must automatically be good for the working class. It was most exuberantly expressed in an article by former SWP leader John Rees on his Counterfire website on 15 June. The SWP, Lexit, and SP commentaries are only toned-down versions of Rees’s argument. The tactical rule, so Rees argued, must be: “if we want to start dismantling the actually existing centres of power and so weaken the real and currently operative engines of exploitation and oppression that means opposing the main enemy: the ruling class currently embedded in the EU”. Gove, Johnson, and Farage are ugly? “Sometimes your ugliest enemy isn’t your most powerful enemy”. The rule must be to set ourselves against the “most powerful enemy”. “Only someone entirely wedded to the linear school of historical analysis could fail to see an opportunity for the left in this situation. Minds uncomfortable with contradiction always have difficulty with social crises, of course”. But if a more-reactionary minority of the ruling class can construct populist support to prevail over the majority, it does not thereby cease to be more reactionary. Revolutionary political crises inevitably come with some chaos and disorder, but the converse does not follow: that chaos and disorder bring revolution. Read Naomi Klein’s book on The Shock Doctrine, which chronicles many cases in recent decades where episodes of social chaos have been used by the right to push through devastating policies which they could not have implemented in calmer times. Rees’s argument, and the SWP’s and the SP’s, that “crisis” of any sort must be good, reflects their demoralisation. Having lost, or half-lost, their belief in the possibility of a real social-revolutionary crisis, they cast around for “crises” of any sort as substitutes. The referendum result has brought disarray in the ruling class, but, as Bank of England governor Mark Carney says, they “are well prepared for this”. The 1992 Swiss referendum vote not to join the European Economic Area, the 1994 Norwegian referendum vote not to join the EU, and the 2005 French vote to reject the draft EU constitution (by a bigger majority than the narrow Swiss and Norwegian votes) all caused disarray: but no ruling-class collapse, no left-wing surge. The disarray in the working class caused by a political event in which Gove, Johnson, and Farage have managed to draw a sizeable chunk of the class behind them is not so easily managed. Donald Trump has drawn in plebeian support to beat the Republican establishment. He might even win the presidential election. That will be a setback, not a great opportunity, for the working class and the left. The clerical hierarchy in Iran channelled mass plebeian support in 1979 to defeat the pro-US majority of the Iranian ruling class. The result was terror against the working class, not socialist advance. There are dozens of other examples in history of the folly of Rees’s scheme. Even the examples he himself cites about advances for the right being opportunities to “to start dismantling the actually existing centres of power” show nothing of the sort. “No-one assumes that the English Defence League is as powerful an enemy as the Tory government, though both must be opposed. The same applies here: the mainstream ruling class block is the main enemy”. But no-one on the left argues that we should ally with the EDL to cause chaos for the Tories, or that, if only we could think as non-linearly as John Rees, an EDL triumph would really be a working-class victory! “We need to seize the opportunity a crisis gives us (as we did when we formed the Stop the War Coalition the week after 9/11, when it would have been so easy to just say ‘the right will benefit’)”. But the right did benefit! The Islamist right gained prestige by showing its power, and the US right gained by getting its mandate to make war in Afghanistan and Iraq. That the left was able to organise some big (though unsuccessful) demonstrations against that right-wing surge doesn’t change the overall picture. And the analogue to forming the Stop the War Coalition then – leaving aside the considerable arguments about how that campaign was run – would be to form a “Stop the Anti-Migrant-Drive Coalition” now, not to celebrate Brexit. 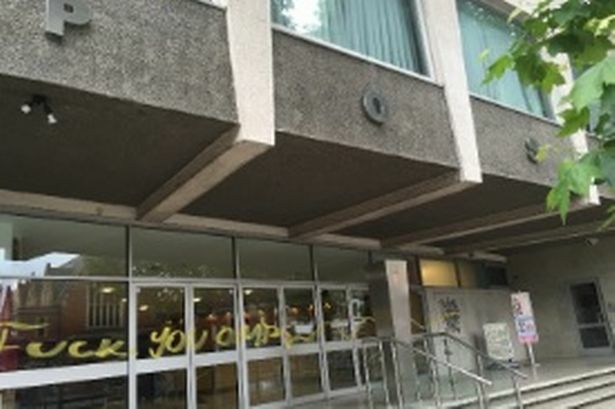 The Socialist Party and SWP statements discuss a matter which does not bother Rees in his dialectical constructions: the character of the working-class element in the vote for Brexit. They insist at length that it was not all racist, and not all pro-Ukip. That is surely true. Little of the feeling against East European migrant workers is based on racial stereotypes. Many people of relatively recent immigrant background have been persuaded that the gates should be closed against new migrants: they are often very aware of the awkwardness of the argument, but have been convinced that migration is now just “too much”. To think of the numbers of jobs, or houses, or hospital beds, as fixed quantities, and respond by saying that the limited numbers must be kept for those already in Britain, is narrow-minded and false, but not racist. Some people with no hostility to migrants were drawn in by the demagogic argument that Brexit would allow “us” to make “our own laws” or to “take control”. (The Brexiters were tactfully silent about which laws originating from the EU they objected to. In fact they are such laws as those implementing EU protections on working hours and agency workers, and even those were not “imposed”, but voted through by the Blair-Brown Labour government – rather reluctantly, but voted through – after Tory obstruction). And some people were swayed by the same sort of argument as the left Brexiters: that, whatever about migrants, whatever about laws, any protest against the status quo, the “elite”, must be good. Very few of those will have been swayed by the left; but in any case, this argument, the most “left-wing” of the Brexit arguments, not really left-wing at all. Going for an incoherent kick against “the elite” is a substitute for and a diversion from real class-struggle mobilisation, not an example of it. The feeling may not be racist or pro-Ukip, but it is such that can be, and has been, channelled by racist, by Ukip, and by Tories. The whole train of thought here, despite or maybe because of the manifest anxious desire of the SP and SWP to show themselves in tune with what they reckon to be working-class feeling, is patronising and manipulative, an example of what Marxists call “middle-class workerism”. That many older workers in depressed areas of low migration voted “Leave” does not mean that the whole working class, or even a majority, voted “Leave”. That many people in the worst-off sections of the working class voted “Leave” does not make “Leave” a more authentically working-class response than the “Remain” stance of younger, more educated (and often more educated precisely because younger), big-city, working-class people. Socialists will best serve our class brothers and sisters who voted “Leave” by arguing with them – not caricaturing them, not dismissing them, but treating them as intelligent women and men who have gone off course, as people do, but can and should be convinced by reason. When they are convinced, class-conscious and socialistic elements in their thinking, now suppressed and overwhelmed by the Brexit demagogy, will come to the fore. The SP and the SWP, by contrast, seem to have given up on convincing workers. They look, awe-struck, at the Brexit surge with its “anti-elite” overtones, and scrabble to suggest ways in which that surge, as it is, can be managed, manipulated, redirected, so as to channel into their desired outcome of a general election and a Corbyn victory. Their approach is similar to a common caricature of the Trotskyist transitional-demands approach (one promoted both by opponents of the approach and some who consider themselves supporters of it): that transitional demands are those which appear “realistic”, not-specially-socialist, not-specially-radical, but lend themselves to mobilisations which can, in a way unknown to the workers involved, slide into socialist revolution. 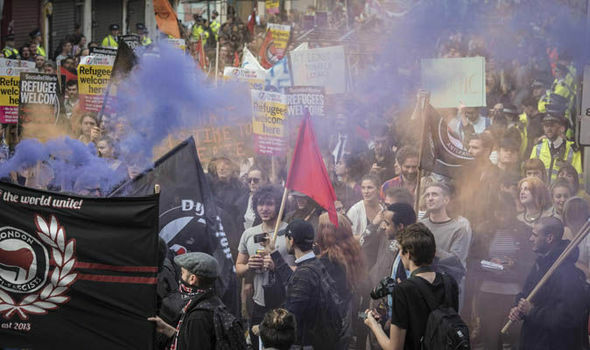 In the SP’s and the SWP’s constructions, Brexit has become a sort of fake “transitional demand” by which the dialectically-attuned can manoeuvre the working class into desired channels. What is to be done now is to conserve and extend workers’ unity, between workers in Britain of all origins and between British and European workers; to defend migrant rights and the worker rights which have entered British law under pressure from the EU; to fight to redirect the social anger expressed in Brexit votes towards social solidarity, taxing the rich, and social ownership of the banks and industry; and to stand up for socialism. None of that can be done if the left falls for the fantasy that the Brexit vote is already taking things our way. The vote to leave the EU reflects deep and growing social distress caused by years of vicious capitalist attacks against living standards, public services and democratic rights. But the vote was also a defeat for labour movements in Europe, for internationalism and for the left. The three million Europeans living, working and studying in the UK will now be fearful about their future. The response of socialists and the labour movement can only be to redouble our fight against austerity, defending migrants and for the socialist vision of a better world. Any concessions by the left to the mood of national isolationism — such as justifying the strengthening of immigration controls — will be disastrous mistakes. Such policies would lead to more despair and a further shift away from the class politics we want the labour movement to champion and build support for in the working class — the politics of unity and social solidarity. The referendum result has illuminated and deepened existing dangerous political fault lines and it has created new ones. Cameron’s resignation will push the “star” demagogues of the Tory Leave campaign — Michael Gove and Boris Johnson — into government. This is a quasi-political-coup. The Brexit camp used the referendum, a vote on a limited issue, to lever themselves into governmental power. By bringing this referendum about Cameron is wholly to blame for his own fate. But getting rid of Cameron is not, as some on the left will argue, a victory for democracy! If a general election were soon held, as some on the left advocate, it would be fought under conditions of chaos, confusion, dismay and reaction. It would not be likely to result in a victory for the left. The referendum result has already been used by the right-wing in the Labour Party as an opportunity to challenge the Corbyn leadership. We defend Corbyn! The huge democratic mandate on which he stood for and won the leadership of the Labour Party stands. Whatever the shortcomings of Labour’s campaign on the referendum, Corbyn was right not to tail-end the Tory’s big business message on Europe, was right not to appeal to traditional Labour voters on the basis of prejudice against migrants. On 23 June, majorities in England and Wales, and not Scotland and Northern Ireland, ensured an exit from the EU. That in itself opened up more division in the working class of the “United Kingdom”. It has already given the green light to the SNP to push for a further referendum on independence for Scotland. While a move towards independence may be seen as making connections with Europe, it will also separate Scottish workers from others on this island. Some of the vote for Leave was based on conservative nostalgia for a UK, or an England, that has never existed. Some of it was expression of outrage by working-class people against long-term insecurity and deprivation. But there was a broader social spectrum than this which saw the vote as a referendum on the general state of society. Not just the older, white working class, but also the younger under- and precariously-employed working class. And, anecdotally it seems, to a limited extent, people from more established migrant backgrounds also saw voting Leave as a way to express feelings of insecurity. And we have to face the uncomfortable truth that many who voted Leave were convinced by dominant racist themes of that campaign — that the way to resolve any and all of these social problems is by stopping or slashing inward migration. The socialist message, that poverty and injustice can be overcome by working-class solidarity, has for many workers been eclipsed by another, meaner, much less ambitious and utterly false vision, which says that only the most limited improvements can be achieved, and then only by cutting out “foreigners”. But none of the perceived social problems — crumbling public services, declining standards of living, worsening urban infrastructure, growing inequality — has anything to do with the EU, or the numbers of recent migrants. It was everything to do with capitalism — homegrown, UK capitalism. Those of us who argued for a Remain vote on the basis of fighting for the working class — in all its diversity — across Europe, did not convince people of our argument. Our alternative — social solidarity and uniting workers across Europe — was not a strong enough message to win the day. That is why the left that said “remain” must urgently come together in the weeks ahead to plan our response to these difficult times. We will oppose the right-wing attack on the leadership of the Labour Party. We will oppose accommodation to all forms of nationalism. We will defend migrants. We will fight for clear socialist solutions on the real issues facing the working class, whether they voted for Remain or Leave. It is especially important to take that message into the working-class communities which did vote for Remain. 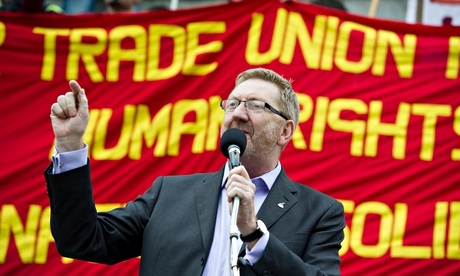 We will fight for unity across the working class – for jobs and housing, against privatisation and to rebuild the NHS. If you want to join this urgent campaign, please get in touch. Or come to our Ideas for Freedom event on 7-10 July to discuss further with us. Further responses to the referendum result will be posted soon. The Leave campaign is finally talking in specifics, giving the public a clearer idea of what life post-Brexit might be like. Posing almost as a government-in-waiting, they now promise the introduction of an Australian-style points-based immigration system. And focusing on immigration is certainly clever politics. It turns the slightly existential issue of sovereignty into something more tangible. Last year, Britain experienced a net immigration rate of 333,000 – though the real figure may be far higher than our unreliable statistics suggest. Many voters perceive a squeeze on public services and fear a loss of control over security. Michael Gove, the Justice Secretary, has claimed that freedom of movement rules have prevented him from denying entry to people with a criminal record, or even those who have suspected links to terrorism. Australia is not necessarily perceived as being anti-immigration so much as a country that demands and gets precisely what it wants. A points system would not necessarily achieve the results that every Eurosceptic is looking for. The Prime Minister has countered that Australia actually “has more migration per head than we do here in the UK”. But Australia is not necessarily perceived as being anti-immigration so much as a country that demands and gets precisely what it wants. As a member of the EU, Britain essentially has to take as many people as wish to come. Outside the EU, the argument goes, it would only have to take the numbers that employers actually need. The attractiveness of this argument will surely cause Remain a little panic. The referendum is increasingly being cast not just as a vote on the EU but on David Cameron’s record in office – and his many promises on reducing migration remain embarrassingly unfulfilled. That criticism is only intensifying from members of his own party gives the impression that this referendum is in fact a choice between two varieties of conservatism. Thanks to Labour’s near silence on Europe, there is a case for saying that this is what it has become. If Leave can use issues such as immigration to reconstruct the Thatcherite coalition of the Eighties – an alliance between the patriotic Right and the usually Left-wing working class – they could reshape politics for years to come. What it will hopefully bring in the next few weeks is a new energy to the discussion. After so much negativity and hysteria from Remain, Leave has offered a positive agenda – an agenda that could rally their troops and give Britain the debate it deserves. I warn you that you will have pain–when healing and relief depend upon payment, because the Brexiters want to privatise the NHS. I warn you that you will have ignorance–when talents are untended and wits are wasted, when learning is a privilege and not a right – as the Brexiters have demonstrated with their lying, consciously dishonest campaign. I warn you that you will have poverty–when pensions slip and benefits are whittled away by a government that won’t pay in an economy that can’t pay, made worse mby the recession that will follow Brexit. I warn you that you will be cold–when fuel charges are used as a tax system that the rich don’t notice and the poor can’t afford, under an ultra-reactionary government unconstrained by EU fundamental rights legislation. I warn you that you must not expect work–when many cannot spend, more will not be able to earn. When they don’t earn, they don’t spend. When they don’t spend, work dies: something then Brexiteers didn’t explain to you as they advocated recession. I warn you not to go into the streets alone after dark or into the streets in large crowds of protest in the light, as the fascistic forces unleashed by Farage, Gove and Johnson seek out another victim. I warn you that you will have defence against immigrants and refugees of a sort–with a risk and at a price that passes all understanding. May I start by expressing Unite’s shock at the death of Jo Cox and our deepest sympathy to her family. We can only hope that the outpouring of grief from across the nation will help Jo’s husband, Brendan and his family in these unbearable times. With many voters still making up their minds about a decision that will shape the future of our country, Oxford University’s Migration Observatory offered a stark warning that despite offering the world the Leave campaign cannot guarantee what would happen to migration if we left. Most voters recognise that our country has reaped many benefits from immigration, from the brilliant doctors in our NHS to the skilled workers helping our economy to grow. Yet across the country people face everyday worries about job security, school places and GP appointments. First, Brexit doesn’t guarantee that migration will come down. In fact a more liberal approach to non-EU immigration – as advocated by the Leave camp – could actually see it increase. Australia – whose points-based system is so admired by Outers – has twice as many migrants per person than we do. The whole purpose of their system is to allow businesses to control who comes into their country. For us this would lead to an increase in cheap labour, bringing down wages and doing nothing to ease voter concerns about insecure employment. Voters also need to know that that the free movement of EU citizens to Britain will not automatically stop if we left. The only way to do that is to leave the single market – an act of economic self-destruction that would be catastrophic for businesses and jobs across the country. Second, we can do far more to deal with the pressures caused by migration from inside then EU. Labour has long pushed for an end to the payment of benefits to people who don’t live permanents in this country, and for a major extension of the time EU migrants have to wait before being able to claim benefits – a commitment secured by the Prime Minister as part of the renegotiation deal. We can also help communities facing the greatest pressure from migration. Since 2001 EU migrants have contributed £20 billion more to our economy than they’ve taken out in benefits. This money must go quickly to areas where migrants are living, to fund schools and health services. This will ensure that people come to this country knowing they need to play by the rules and work hard, and will reassure Brits that we have a fair, under control system that works for everyone. And finally, the overall benefits of EU membership are massive. From businesses in Yorkshire to the President of the United States – and pretty much everyone in between – there is now an unprecedented consensus that leaving the EU would hurt our economy and hit our pockets. We cannot allow voters to fall for the spin that a vote to leave is the only way to deal with concerns about immigration. We can do far more to address both the level and the impact of immigration while remaining in the EU. I very rarely agree with the Prime Minister but on this he’s right: was are stronger, safer and better off in.